Back in August, members of the JFC team undertook a mammoth challenge to raise money for charities The Royal Agricultural Benevolent Institution (RABI), Riding for Disabled Association (RDA) and Embrace FARM – a farm accident support network based in Ireland. 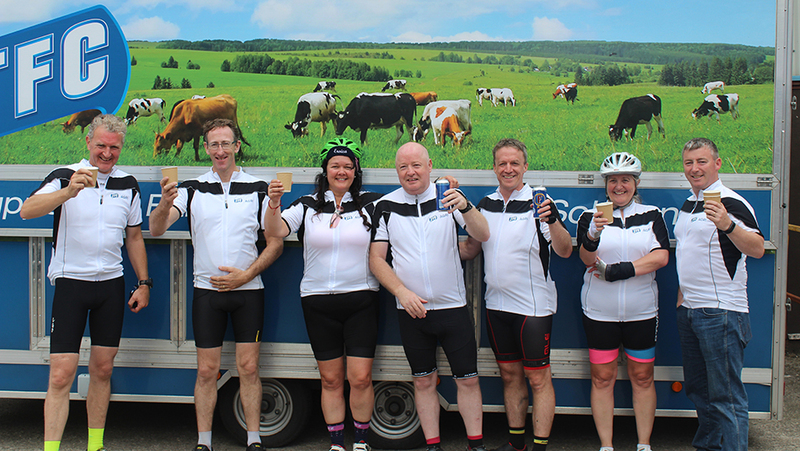 Sue Taylor, JFC UK National Sales Manager and Dave Curley, JFC Civils CorriPipe Sales Manager, accompanied by friends Stephanie Pierre, Matt Corcoran and Frank Conway, put power to the pedals to ride 200 miles across three countries in just two days. Starting at the JFC Head Office in Tuam, County Galway, the route took the team to the Dublin ferry port where they said goodbye to Frank, across to Holyhead, Wales (where Shropshire farmers Neil Mainwaring and Hugh Pinney joined the team) and onto the UK JFC site in Oswestry, Shropshire. The hardest part of the challenge came with the section out of Betws-Y-Coed, which saw the team climb a staggering 1,118ft to reach the top. Yet all six riders entered the Maes-Y-Clawdd Industrial Estate smiling from ear to ear, crossing the finishing line together as a team who had tackled and triumphed 200 miles in two days with a total elevation of 5,903ft. All the hard work paid off as the team were able to raise over €700 in Ireland and over £1000 in the UK – with final totals yet to be calculated. Supporters are still able to donate via JustGiving – search JFC Manufacturing and donate to either RABI or RDA.